The debate over the BC carbon tax is proving that politics really does make for strange bedfellows. Joining the B.C. 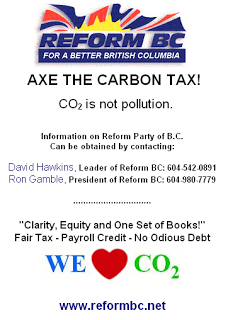 New Democratic Party in vowing to axe the tax is the Reform Party of B.C., who have adopted the slogan, “We ♥ CO2.” “We will repudiate the tax — it’s a scam,” said Reform leader David Hawkins. The party would also set out to prove that the accepted carbon-driven model for explaining climate change is “scientific fraud.” Also lining up behind the NDP in railing against the carbon tax are the B.C. Conservatives, who have made the issue one of the six main planks of their platform. Not only would they give the taxation of carbon the boot, the party also proposes getting rid of B.C.’s property transfer tax and lowering personal and corporate taxes.So really, voting for any of those three parties shows that you are voting for science rather than supporting a flawed ideology which raises energy prices and subsequently everything else. Furthermore, the Conservatives and Reform BC will not just replace a scam tax (carbon tax) with another scam tax (cap-and-trade). Just say NO to taxing plant food on May 12, 2009! Excerpt from a past letter to Prime Minister Stephen Harper from the Reform Party: “Reform BC leader David Hawkins, appreciates the support of Siyam Kiapalano(TM) in the Party’s efforts to trace the source of the [BC] Climate Dividend and to present a scientific, economic, legal and constitutional argument for the abolition of a Liberal carbon tax “…[sold to the public] “with the spurious claim that anthropogenic CO2 is a principal component of harmful climate change.” See the full letter HERE. Lol yep, except they won't get elected this time around. But if enough people vote, who knows what could happen for the next election if they get more seats! NDP is equally as bad as the Libs in BC. I like this news….its good to see other parties not following the same PR campaigns to please the far left greenies who dont understand science or dont even care because they simply dont like industry. 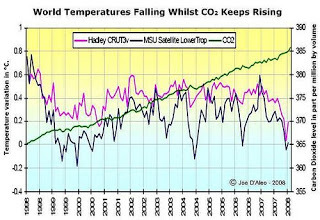 Restricting or taxing CO2 is a stupid stupid idea. But its a cash cow! Climategate; smoking gun! Any party supporting the carbon tax must be defeated.